The date for applying for CAO is getting ever closer (1st February). If you, like many students out there are still not sure about what to do with your future, don’t worry, the secret is there are people in their thirties that still don’t know. What's this one on about I hear you say. Ikigai, no, it's a salmon skin roll. Ikigai is a Japanese concept about finding your purpose and what makes you jump out of bed in the morning. 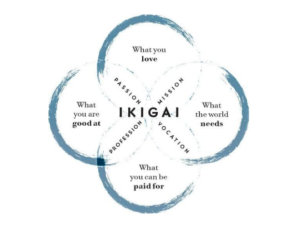 “Ikigai” is finding the balance between what you're good at, what you love, what the world needs and what you can be paid for. It makes sense if you think about it. Let's face it if it was just about finding what you love sure we’d all be out finding a job that involved napping and eating. When it comes around to filling out the CAO form, everyone has an opinion. People can only advise from their own experience or their perception. Yes, it's good to listen to what those who know you best have to say, but at the end of the day, it’s a decision you have to live with. So stay true to yourself, don’t let people try and influence your decision. It's never been easier to reach out to past graduates to find out more honest feedback on the course your interested in. If you haven't already I would set up a LinkedIn profile. LinkedIn is an excellent source of inspiration and way to connect with people in the industry your interested. Familiarise yourself with job specification you would aspire to and get a feel for the type of roles companies are hiring for. Everyone has been in the same position as you at some point, so reach out to graduates of courses you are interested in. They will be happy to share their experience with you. After you have established your "Ikigai", what makes you tick, draft up a shortlist of potential courses. Research the modules that are involved in the course. Oftentimes you can read the title of a course and find that it is completely different to what you expected. Think also about what graduate jobs you can get at the end of the course, will you need to do a masters or further post-grad for the career you want. Now, this is one I can't stress enough due to my own personal experience. Do your research on the place you will be living before signing up for a 3-4 year college course. At the ripe age of 22, I upped my life and moved to Aberdeen in Scotland without as much as visiting the city. I soon learnt that it was the 2nd most expensive place to live in the UK, second only to London and the scavengers seagulls ruled the city. Not ideal for a poor student with a fear of birds. So visit the city you are considering making your home for the next three years. You always hear people say, college years are the best years of your life, it's true they are but they are much more enjoyable in a city you enjoy living in. Don't limit yourself to colleges in Ireland. With Europe on our doorstep and the price of Ryanair flights, there are so many options out there. Studying abroad would also give you the opportunity to learn a language, a valuable skill to add to your CV. And finally, don't panic, its a total cliche but "What's for you won't go past you", everything will come to you at the right time.